For example, Lisa recently serviced her vehicle at her local Bosch Car Service workshop. The next weekend, Lisa and her family drove into the country for a weekend away. It was during the drive that she noticed a strange sound coming from under the bonnet. Remembering that Bosch Car Service offers Nationwide Warranty, she located the closest Bosch Car Service in the area and contacted the workshop. She explained that she normally serviced her vehicle at a different Bosch Car Service workshop and named them. Armed with this knowledge, the Bosch Car Service technician knew that this could possibly be a Nationwide Warranty claim. Whilst checking Lisa’s vehicle over, an issue was found. Therefore, under the Bosch Car Service Nationwide Warranty program the issue was fixed and a satisfied Lisa could return to her weekend trip without the hassle of any additional costs for the repair. With over 13,000 workshops worldwide, the Bosch Car Service network continue with the Robert Bosch legacy. Therefore, we offer you reassurance on all vehicle servicing, maintenance and repairs by providing you with the Bosch Car Service Nationwide Warranty, which you can depend on. The Bosch Car Service Nationwide Warranty period is 12 months or 20,000kms for products and repairs – whichever comes first from the date specified on the invoice provided by an authorized Bosch Car Service workshop. Repair, alteration or modification carried out by any third party without the written consent from the respective Bosch Car Service workshop. Normal wear and tear. Excludes consumable products such as globes, wipers and fluids. Product being used for a purpose other than that for which it was designed. The liability under this warranty shall be limited to the replacement or repair at the option of the respective Bosch Car Service workshop at the time of failure. Claims under this warranty will be considered only if made with an authorised Bosch Car Service workshop. for any other reasonably foreseeable loss or damage. You are also entitled to have the goods repaired or replaced if the goods fail to be of acceptable quality and the failure does not amount to a major failure. If you’re within the Bosch Car Service Nationwide Warranty period and you need to make a claim, contact your nearest Bosch Car Service workshop. There are approximately 140 Bosch Car Service workshops across Australia and New Zealand. Refer to the back cover of this brochure to locate your nearest Bosch Car Service workshop. When making a claim at your nearest Bosch Car Service workshop, ensure you advise them of the current issue and provide them with details of the last authorised Bosch Car Service workshop your vehicle was serviced or repaired at. 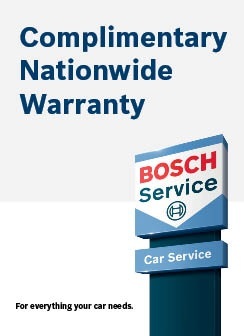 The Bosch Car Service Nationwide Warranty program is complimentary with every service or repair conducted at an authorized Bosch Car Service workshop. Additionally, no excess fees apply.